Power of the Purse is turning SWEET 16 this year, and we are so excited to celebrate by rolling out the pink carpet (literally!) for our donors and their guests. Grab your favorite cocktail dress, your best friend and your cell phone and join us for our first time ever at the Columbia Museum of Art on Thursday, May 23 at 6:30 PM! 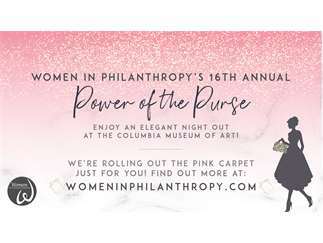 Power of the Purse is an annual event held by Women in Philanthropy to raise money for women and children in need in our community. The event features a one-of-a-kind silent auction of designer purses, vacation, spa and restaurant packages and more! This year, we will have some fun surprises new to 2019, and you will be able to bid easily using your cell phone! It's going to be our best Power of the Purse yet, and we don't want you to miss it! Special thanks to our Signature Sponsors: Abacus Planning Group and Nephron Pharmaceuticals!